Silver spot prices followed gold ( and other commodity markets ) lower yesterday, ending the silver trading session lower with a wide spread down candle, and in percentage terms the decline in silver was more marked than that for gold. 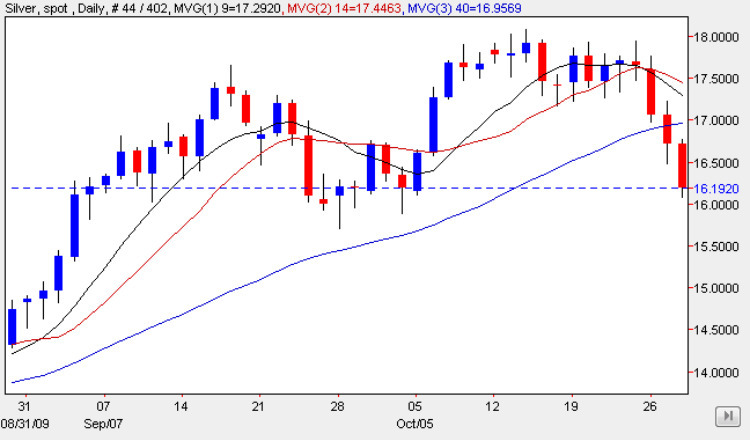 Whilst both commodities have a bearish flavour, the technical picture for spot silver is more marked than that for gold, as yesterday’s candle ended the day well below the 40 day moving average, and deep into the support region between $17.50 per ounce and $16.00 per ounce, and should the lower level be breached then this will signal a deeper move to the next area of support in the $15.50 per ounce price handle. Having broken below the secondary top in the $17.25 per ounce region, the upwards trend for spot silver is now firmly over, and for any rally higher we must now wait for a technical candle on the daily chart, or for one of the support regions outlined above to provide the necessary platform for a re-basing and recovery in spot silver.